A Miracle On 132nd Ave. I slumped in the passenger seat as she backed down the driveway. I looked longingly at my house wishing I was wearing my over sized pajamas with a warm dog snuggled near me on each side. I glanced at the clock. It was 7:30 and we were already an hour late. “I really don’t want to go to this,” I thought. She had invited me to attend a prayer gathering at a home very close to mine. It wasn’t the theme of the evening that was bothering me as much as it was that I didn’t want to be around people. In my life, I have gone to many of these type of meetings with enthusiasm expecting for someone to give me a ‘word’. However, I wasn’t much in the mood for a word, a sentence or even a paragraph. Situations swirling around me regarding relationships, finances and the approaching pressure of the holidays was fully weighing me down. I had gotten out of bed that morning feeling absolutely dead inside. I was quickly finding out that my frustration at not being able to fix my problems was leading me quickly down the dark road of depression. Every time I went inward, I felt an empty space of nothing. On the one hand, I didn’t want to care about anything, and on the other I felt so grieved at the overwhelming loneliness I felt. “I would like Brad to pray for you while we are there,” she said. I was fine with that, but I was not going to open up and let any one of these people in on my problems. Either God was going to reach out and take hold of me or I was on my own. I watched the streets go by as she followed her GPS and its instructions. The drive was only eight minutes but it felt like an eternity. I couldn’t wait to go back home and flop down in my despair with a cup of hot tea. For weeks, I had been running low on money but made choices to cut back on things to make it work. At the same time, I kept getting small promptings to give where I could to put what I had into circulation to help combat the fear. Yet, I knew I had obligations coming and the strain of it all was taking me down. I had heard on the radio that the average American family spends $961.00 for gifts. I don’t know if I come close to that amount, but being in the position of not being able to give anything was part of my unhappy state. The decorations and music in the stores were not helping. Everything was simply reminding me that I was going to be left empty handed. My friend parked her car and I stood by the driver’s side as she collected her purse. I did not tell her that I asked God for money. We walked into an empty upstairs but found about twenty people in the basement listening to a man speaking about how God could fix anything if you let it happen. I watched as people went forward for prayer as he spoke positive, uplifting words. We were trying to slip in quietly. She found a seat near the front while I took one toward the back. My intention was to sit and watch. “The one in the pink. Do you have needs?” He pointed right at me. There was no escaping it now. I had worn the brightest pink hoodie in my entire collection. I paused because I knew what was coming. “Then come on up.” Oh, boy, so much for sitting in the back and letting the evening go by. I could feel my friend’s eyes on my back. I shook my head no. I was holding to my vow in the car on the way over. If God had something to say, then it would present itself without me giving out any information. He began to speak, and his words pierced my heart. Two weeks before this, I had visited a church one evening and went into a room with two women who sat quietly for a few minutes praying and then began to speak. They had told me that my future was ‘bright’ and that there was nothing to worry about. They kept saying that I was going to be okay and not to worry or fall into despair. His words greatly mirrored what I had already been told. I felt my resolve crumbling as my pain, anger, frustration and sadness burst out of me. As the evening went on, more people came up for prayer, and I was still not totally out of my funk. I was still wallowing in a puddle of tears, so I attempted to clean my face up which left all of my makeup on a tissue. “This is Brad,” she said to me. He was meeting me at probably one of the lowest times of my life. He knelt down by my side, and I closed my eyes as he began to pray. Unknown to him, I was completely consumed with worry about my finances from the time my eyes would open in the morning. I would get out of bed just to immerse myself in tasks to keep my mind off of it. As he spoke, I felt myself relax because his words were ringing true. He called his wife over who was so joyful that no one could possibly stay sad in her presence. It was energy that was alive and contagious that only further erased my negative state of being. It was like the two of them picked me up, stood me on my feet, brushed off the dirt and put me back on the road. As she prayed for me, I noticed he put his hand over his heart, then he leaned over and whispered something in her ear. She nodded and smiled and he got up and walked away. I figured maybe he was leaving me in her care while he helped another. 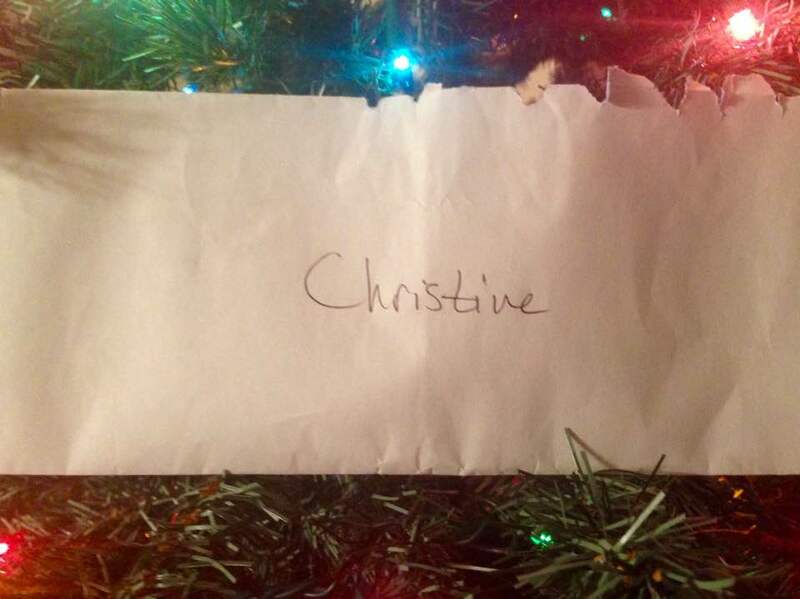 Within moments, he returned with an envelope with my name written on it. I looked at it not fully understanding. I eventually took it from him and put it in my purse. The pain had disappeared, and I felt happier and more secure. It’s difficult to describe an event when it is a spiritual experience. But, much like having a surgery, I felt as if a toxin that was choking the life out of me had been removed. As I slid my finger along the enclosed edge, I suddenly recalled my silent plea to God for $1,000 in cash on the way to meeting. I carefully opened it and saw a $100 bill on top. I slammed it shut. “Oh my gosh! Oh my gosh! I think God did what I asked. I think…” I started crying again as I looked at and counted $1,000 cash, all in $100 bills, in my lap. “WHAT! ?” my friend said as she leaned over to see. We headed for curbs and lawns as she tried to keep the car on the road. I could not speak because I felt how much I was truly loved. For you see, it wasn’t just about the money, it was about feeling that divine, strong, powerful connection between myself and the One who is unseen. My request to God was said as a sort of ultimatum that I thought would go unanswered. I had asked for something to touch with my hands but it was so much more touching to my heart. My faith was completely restored and in the past week since this event, I have found myself feeling more secure than ever and my problems seem to be more distant now than a heavy load on my back to carry. What I did that night was I shut myself away from others and sent up a private request that only my Creator was aware of. And, as I did so, my reward presented itself rather quickly. I encourage all of you that are weary to never give up, and to ask for supernatural help. I had no idea that I would go into a stranger’s home for a mere two hours and come out the recipient of a miracle on 132nd Ave. I yanked with my gloved hands as the bush’s thorns started to bite into my palms. I was attempting to follow through with my spring cleaning list and this eyesore was being removed whether it wanted to be or not. I had worked around the roots with my shovel and thought that it would easily slide right out of the earth. Instead, it wouldn’t budge. I felt a twinge across my lower back as the muscles strained there and along the back of my calves. Without warning, I was airborne across the lawn with the prize in hand over my head. It had played a nasty trick by suddenly and unexpectedly releasing its hold. I landed with a thud directly on my back while clutching the dirty monster to my chest. I looked up at the sky and did an inward safety inspection. From time to time when I have taken a spill, I often lay still for a minute to make sure nothing is fractured, dangling or throbbing incessantly. Feeling no pain and knowing that the coast was clear, I began to laugh. I pictured the neighbors peering out their windows seeing an irate woman yelling at foliage and then being flung to the ground in a heap. I sat up and brushed the dead grass out of my hair. I was covered in soil but I was triumphant. Not only had I gotten the rebellious bush out of its place, but I could check something off my to do list, and I had done it myself. A few days prior to my seek and destroy mission, I sat on my back porch to write down what I wanted to get done around the house. I had come to have a love hate relationship with my dwelling after it was awarded to me in the divorce. My marriage had been one of the traditional nature where I attended to the indoor tasks while he worked outside. I had found myself slightly unprepared to handle both, and my budget wasn’t allowing for too much improvement. I had determined to do what I could to clean up and declutter where I could without generating an expense. Removing the long forgotten about landscaping had been a priority. As the list came together, I glanced over at the above ground pool that had a stocking cap at the bottom of it. In the days when it was working properly, a cover would have concealed it at this time of the year. But, the liner had succumbed to a tear, so it was drained and my youngest daughter and her friend had found delight in constructing a snowman in it over the winter. Frosty had melted and his hat, nose and eyes were all that was left of him. It brought me a bit of sadness to see the pool in that state of disarray as I recalled the girls and I enjoying soaks in it on hot summer days. I knew I couldn’t fix it due to money constraints so I didn’t add it to my list. Do what you can on your list. I will send a man to help with the pool. I didn’t know what that meant exactly so I began to clean up what I could a little at a time day by day. One afternoon, about a month later, my doorbell rang. When I answered it, a man with a city badge hanging on a lanyard greeted me. I let him in and we walked from room to room as he made notes and checked out the interior of the house. He got really quiet and took a step closer to the window to look down on it. I couldn’t believe what I was hearing. When I made the statements about the pool, it was more of a complaint than a proposal. I wasn’t asking for help. I was bemoaning my existence. He had my contact information and we parted ways. He went on to say that he was only in town for a few days to visit but he would enjoy doing the work. That is when it came back to me…. I will send a man to help with the pool. I agreed to let them fix it, and within a few days my pool was up and running again. Not only did they both work on it in the evening, but they also purchased chemicals that I needed to keep it in good shape. They didn’t ask me to be home while they were there, but requested that the side gate remain unlocked so they could come and go. One night, I arrived home and went outside to see how they were coming along. I found three different colored lounge chairs sitting on the deck. They knew that I was a single mom with two daughters, so they had purchased us each a place to sit poolside. The pool was filled with sparkling, crystal clear water. It had been restored to perfection. After all that, and many years later, my fears of not having enough money or being taken care of should not even exist anymore. Right? No. I still fight with it at times when I am faced with uncertainty and not knowing how I am going to overcome a situation. Buy yourself a bouquet of pink roses tomorrow. Inhale the scent of them and know that I am in charge of everything. I drifted off to sleep wondering how roses were going to improve my outlook on life. Buy yourself a bouquet of pink roses. Breathe in their scent and know that I am in charge of your life. I obediently walked right over to the floral section. There was an array of all colors, but only one small bunch that housed five pink roses. I grabbed the cellophane wrapper and turned it around to check for a price. 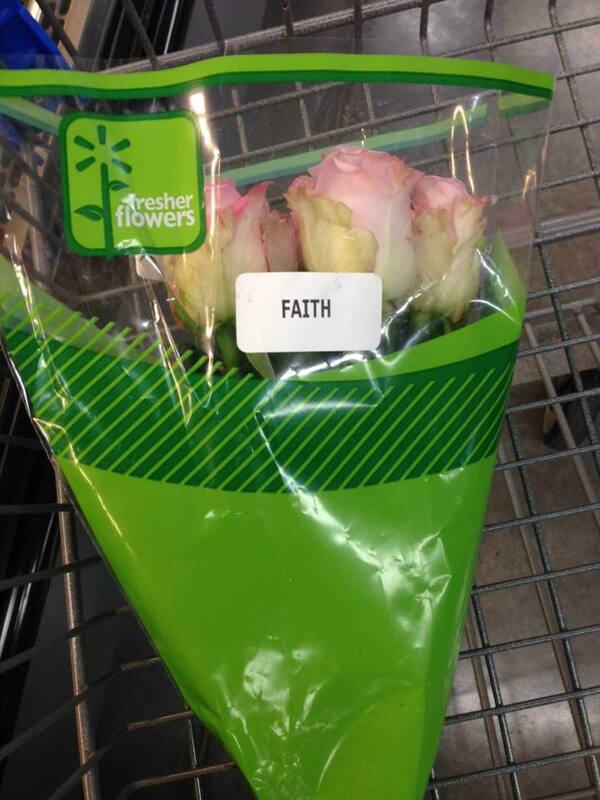 A small label was attached to the front that read: Faith. I immediately looked for more pink roses and found none. I checked all the other flowers for the same word and could not find it! Some said smile, some said freedom, but not a single batch of them had this message written on them. I gently placed them on the bottom of my empty shopping cart. Tears began to well in my eyes as I smiled and thought how absurd my worries are. Just more proof that we are loved unconditionally even if we don’t feel it at times. In all of your ups and downs with this life, cast your care on God to bring you through, and take some time to stop and smell the roses.